The Data Connect RM16UI-DUALAC modem shelf is designed for centralized network that require up to sixteen concentrated DCE V.3600UI-RM modem cards in a computer room, a telephone closet or an industrial environment. The DCE RM16UI-AC modem shelf is constructed of heavy guage steel, plated for corrosion resistance. the modem shelf is comprised of 2 AC power supply, two levels of managed within the Network Management System (NMS) via RS485 and/or RS232 ports on the backplane, the Network Management Controller (NMC), an area for one to sixteen modem cards, and a backplane for hardwiring the dial or leased lines, an area for connecting AC or DC power and DTE access via DB25F connectors. The first level of network management only requires a rack. In this application, the NMC unit is responsible for the operation of NMC. The NMC allows you to set up, control, and test any specific modem card in the same shelf. The NMC will amplify an audible alarm and visible LCD message through the operation of the front panel keys. The second level of network management is designed for multiple racks in a large size network. The Network Management requires a NMC that is composed of a computer and control units “Daisy Chain” structure is responsible for the operation of the NMS. In this application, the structure can manage up o 130,000 DCE V.3600UI modem cards via 8126 RM16UI-DUALAC modem shelves. The DCE V.3600UI-RM modem cards and the dual power supplies are hot swappable. 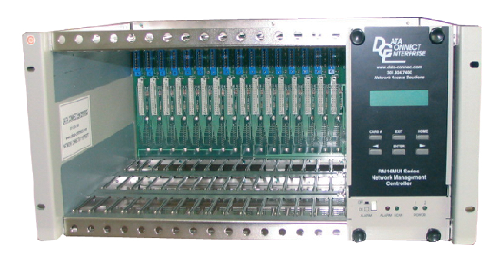 The front panel controls both internal DCE V.3600UI modem cards and remote V.3600UI, V.3600UI-DC, V.3600UI-DC24, and V.3600UI-DC12 standalone modems. The dual power supplies are fully redundant. The AC power supply operates at 90-260VAC, 47-63Hz with a power consumption of 180 watts.